A very interesting, well-attended afternoon Workshop, to bring together members of ITI’s regional group in Yorkshire (YTI) and translators from the North East Regional Group (NERG) was organised by YTI on the theme of food and drink on Saturday 23 November January 2013 at the Swarthmore Education Centre in Leeds. The workshop was attended by around 45 participants, with one travelling all the way from Leicester. YTI now has over 100 members and it was the opportunity for some of them to attend their first CPD event. 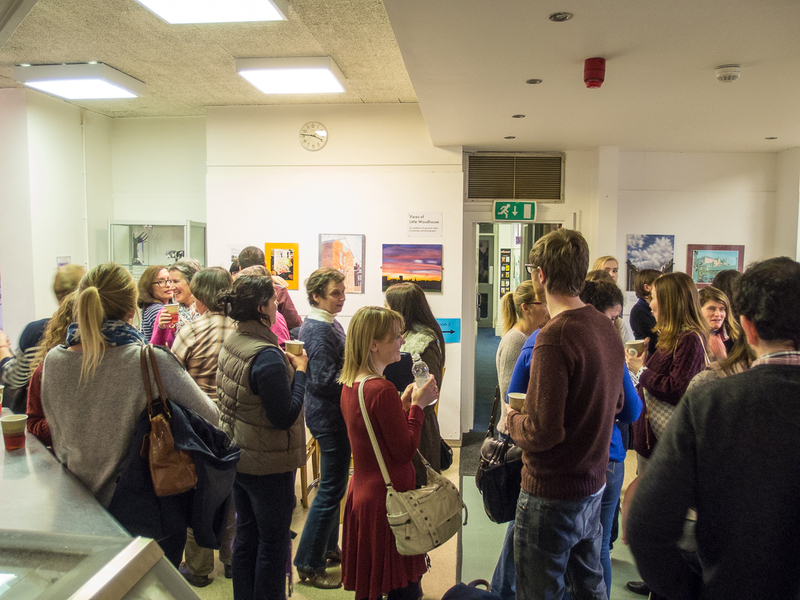 Those arriving in advance of the Workshop were able to meet new and familiar colleagues, catch up on news and generally network over a delicious lunch served just next to the meeting rooms in the centre. Meanwhile, the other participants arrived and the Workshop began with the group assembling in one of the larger meeting rooms to find out how the afternoon would be organised and be divided up into their language groups. Six languages were represented (French, German, Italian, Spanish, Polish and Portuguese) and the group was split up into 10 groups according to language pairs so that participants could put their heads together and grapple with a range of challenging texts dealing with facts about food and drink, menus, promotional leaflets, recipes, etc. The conversations were lively and it was a very useful opportunity to see how other translators deal with some of the linguistic challenges found in such texts, in particular the translation of traditional dishes and ingredients for which there may be no equivalent in the target language. Everybody had the opportunity to network during the mid-afternoon break and to enjoy putting theory into practice by sampling some of the delicious home-made cakes. Overall, the Workshop provided an opportunity to share translation experiences and, for those who were unfamiliar with the topic of the workshop, to gain some insight into the challenges presented by translation in the food and drink sector. The Workshop was extremely well-organised by YTI’s hard-working coordinators who had taken care of the photocopying and meeting arrangements and their efforts were greatly appreciated by all the participants. On the evening of Saturday 9 November a group of 19 people made up of YTI members, their friends and family descended upon the beautiful – and rainy – city of York for a multicultural evening of drinks, food, music and then more drinks. Unfortunately for me, who could not make it to The Spread Eagle for a catch up, preliminary drinks and the reportedly delicious Jamaican street food, the ‘more drinks’ bit didn’t actually materialise. It was an entertainment‑packed evening all the same, but I have now made a mental note not to pass up on the early drinks next time. 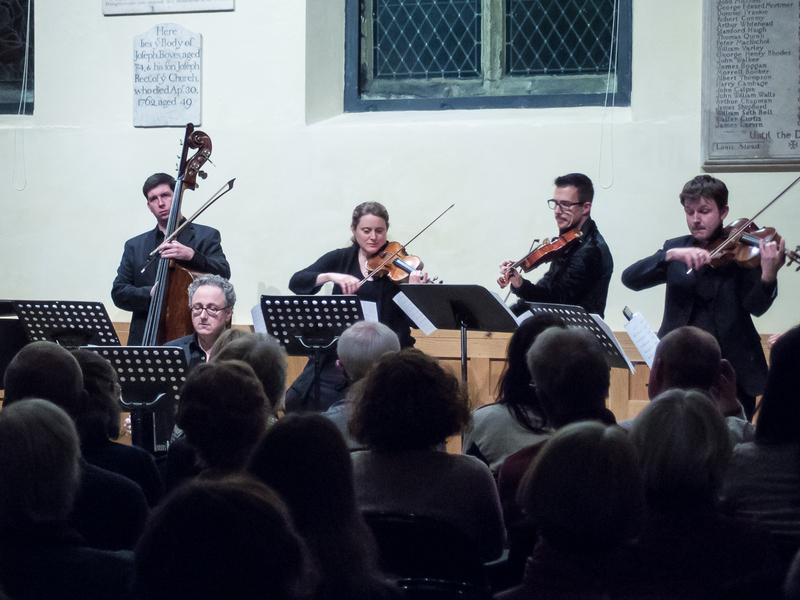 The actual concert took place in the National Centre for Early Music, which occupies the converted medieval church of St Margaret, in the heart of York. This is a very special, small venue, with a very intimate feel and wonderful acoustics which attracts a very varied range of top class artists. So really, it was not only the wine I was looking forward to. I even convinced my other half to join us, albeit with some trepidation. This was the first time I was mixing the weird and wonderful world of translation with my weird and wonderful personal life, this time in the shape of my husband, who was promptly welcomed into the fold and made to feel welcome like one of our own – phew! We all met up in the foyer, where Charlotte handed out the tickets, we got some drinks (finally!) and we made our way into the auditorium, where we managed to find a block of seats so that pretty much the whole group could sit together. Then the music began. After a wonderful rendition of a Bach fugue, Orquesta Tangazo launched into a virtuoso tour of tango music, from its early livelier rhythms to the more modern Nuevo Tango of Ástor Piazzolla. We were treated to no less than 18 different tango melodies, including a very interesting contemporary one written by one of the players. I must confess Piazzolla’s ‘Adiós Nonino’ and Carlos Gardel’s ‘Volver’ brought more than a tear to my eye. That’s tango for you. 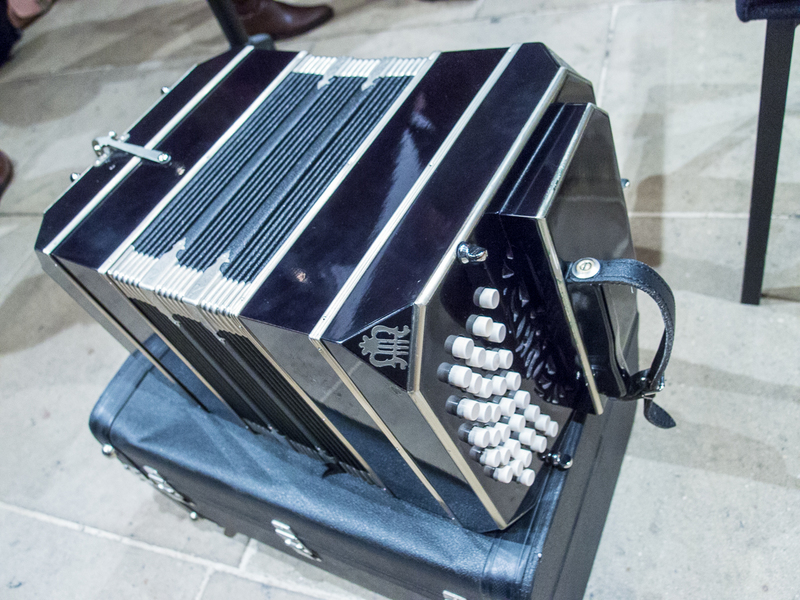 Some of our members were keen to have a close look at the Julian Rowland’s very impressive bandoneon, the concertina-shaped soul of the orchestra, and they had a chance to do so in the interval. It was a thing of beauty to the eye and the ear. The rest of the band was equally impressive in their command of the piano, the violin, the viola, the cello and the double bass, the latter unusually prominent and played with real gusto. Finally, we were treated to an encore that was refreshingly delivered without the need for the traditional walking-off-then-walking-back-in ritual. At the end of this excellent concert, most of us stayed in the foyer for a final chat, which resulted in the NCEM staff patiently waiting to lock up behind our love of language and its usage. Literally. Judging from people’s comments, everybody enjoyed the music and the various bits of the evening they attended. Not having been able to meet up beforehand, I left with the feeling of not having chatted long enough with enough people, so I am looking forward to the next YTI outing to put that right. A big thank you to our wonderful committee for organising this very enjoyable event.